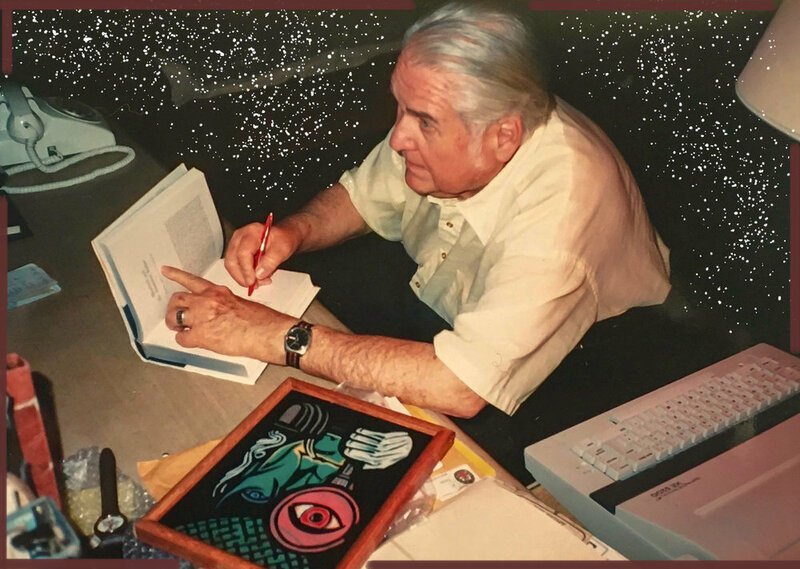 You’ve heard of John Bennett Shaw (BSI-1965), the “Hans Sloane of His Age,” the “Sage of Santa Fe,” the “Johnny Appleseed of Sherlockian Scions,” the creator of The Shaw 100, the Ragged Shaw quiz book, or the Really Ragged Shaw quiz book, right? Perhaps you were fortunate enough to have met him or to have known him as a personal friend. His name crops up in annotated versions of the Sherlock Holmes canon, such as those by William S. Baring-Gould and Leslie Klinger. There is a reason for that: Shaw was unique in the annals of Sherlockian lore in the United States and around the world. And no one had more fun with Holmes. By the age of 10 John Shaw was already collecting books, especially the Sherlock Holmes stories by Sir Arthur Conan Doyle. During his life he amassed an incredible collection of Sherlockiana, and squeezed it into every nook and cranny in his adobe home at 1917 Fort Union Drive, Santa Fe, New Mexico. When the time was right he made financial arrangements with the University of Minnesota Libraries to catalog and house his entire stash. “They will get my books over my dead body“ was a phrase he shared with visitors. The year after his death, in October 1995, his collection was dedicated as the John Bennett Shaw Collection at the University of Minnesota. Since then, other collections have been added, and today it is known as the Sherlock Holmes Collections. But John Bennett Shaw was much more than a collector of “all things Holmesian,” as he was fond of saying. He was also a mentor to individuals interested in Holmes and to those wishing to start a local Sherlock Holmes chapter (or scion); he was a great humorist with a quick and devilish wit; and he was a friend to Sherlockians around the world, many of whom were members of the Baker Street Irregulars, founded by Christopher Morley in 1934. The B.S.I. in New York City was the first-ever Sherlock Holmes society. During his Tulsa days, Mr. Shaw dressed as a businessman, in suits and ties. After moving to Santa Fe, he adopted the Southwest dress code—relaxed, with turquoise and silver belt buckle and bolo lanyard-like necktie. Only 640 miles separate the cities of Tulsa (OK) and Santa Fe (NM)—the cultures where Shaw’s reputation was forged and refined. Tulsa was a booming oil town founded in 1898, only 15 years before John was born. Santa Fe, founded in 1610 and the oldest European community west of the Mississippi, had been a gathering place for native tribes for hundreds of years. Citizen Shaw made lasting contributions to both cities. Martin Gardner, a life-long friend of John Shaw, was born in Tulsa in 1914. A brilliant author and mathematician, Gardner was, for many years, the games editor at Scientific American magazine and editor of numerous editions of The Annotated Alice, the most recent being the 150th Anniversary Edition, published by W. W. Norton & Company, Inc. (2015). In a story reported by Vincent Starrett in the Chicago Tribune in 1948, Gardner tells of an incident about Shaw - the Bookseller and Bibliophile. (Story shared by Ray Betzner). The year before John was born, Ronald Knox, an Anglican priest in England, published his essay, “Studies in the Literature of Sherlock Holmes” (1912). Written in a style that assumed Doyle’s characters were real, the essay was the beginning of the Grand Game. In the Game, one holds that Holmes and Watson are real individuals, not fictional characters devised by Arthur Conan Doyle. It further assumes that Dr. John Watson wrote the stories and that Conan Doyle was his literary agent. John loved games, and this one was to shape the contour of his life. Photograph of downtown Santa Fe by Jim Hawkins (2016) from Fort Marcy Park. The 105-foot tower known as the Bataan Memorial is part of the 1950 renovation of the state capitol building of New Mexico. After the Shaw family moved to Santa Fe and John and Dorothy were married in 1971, John continued to increase his library, the world’s largest private collection of books, pamphlets, comics, and anything remotely related to Sherlock Holmes. 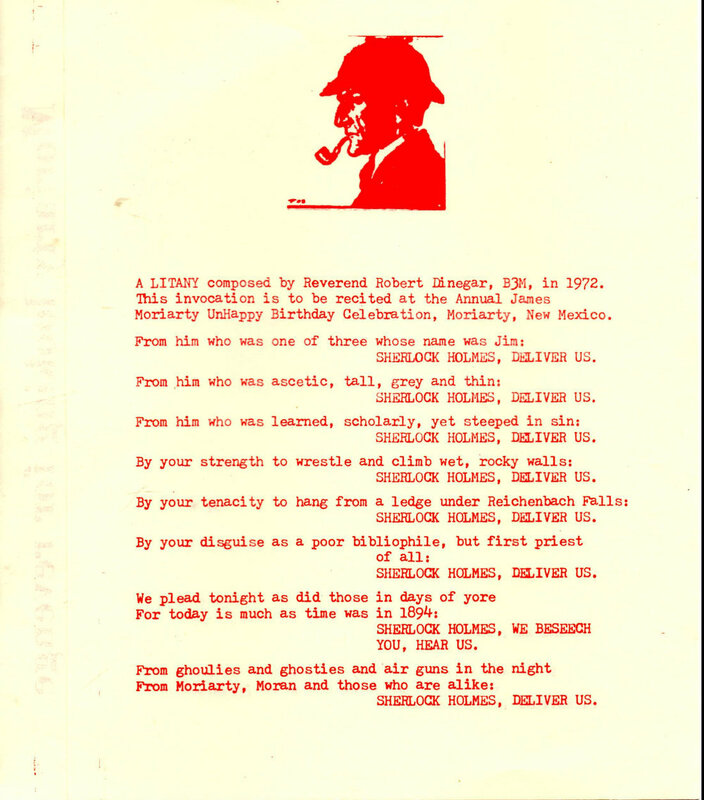 He gathered his acquisitions from all parts of the world, writing and telephoning booksellers and other Sherlockian collectors in the Pre-Internet Era of long ago, without the benefit of a computer! John reminded other serious collectors to admit that you cannot get it all, ever— no one can, and, importantly, that you cannot take it with you. Remember that, and then let me have it. Prior to his death in 1994, having made financial arrangements with the University of Minnesota, Shaw transferred everything to the Rare Books Collections. There his entire collection was cataloged and made available to interested Sherlockians, whether visiting the stacks in the library or visiting on-line. Much of what is presented here is from that collection, with permission from Tim Johnson, curator of Special Collections & Rare Books at the University of Minnesota, and with additional items from individuals who eagerly sent digital copies from their own collections. In 1971 John married Dorothy Rowe Shaw. The Shaws’ were gracious hosts to all who came to visit. Most of the visitors were Sherlock Holmes fans who had met John and Dorothy at Sherlockian events across the U.S., including Baker Street Irregulars dinners and local scion meetings in several states. Known as the “Johnny Appleseed of Sherlockian Scions,” he helped many Sherlock Holmes groups launch their scion activities. Dorothy Rowe Shaw enthusiastically joined in her husband’s Sherlockian hobby by constructing a miniature model of the rooms at 221B Baker Street (see image below). My personal remembrance of being at the Shaws’ residence was that Dorothy baked cookies for my children, Travis and Hannah, as John and I poked through his library and talked Sherlock Holmes. It is not a place where one would expect to find the world’s most famous consulting detective—he of fog, shag tobacco smoke, gasogenes, Victorian sitting rooms, hansom cabs, bleak manor houses, and half-sovereigns. “A man of exceedingly aristocratic type, high-nosed and large-eyed, with languid and yet courtly manners,” eating Mrs. Hudson’s sopapillas, wearing turquoise and silver jewelry beneath his Inverness cape, examining with a magnifying glass pastel images of howling coyotes, and festooning the entrance of London’s best-known, nonexistent address with red chilies? Could the fateful first meeting of the retired Army surgeon and the “desultory and eccentric” chemistry student have begun with the latter’s words, “You have been in Albuquerque, I perceive”? Yes, Watson, the game is afoot in Santa Fe. To download the Conklin article in its entirety, Click Here. The sign Shaw posted at his residence in Santa Fe, claiming the street for Sherlock Holmes. Soon after arriving in Santa Fe, John posted this sign in the front yard at 1917 Fort Union Drive. Locals who were not familiar with the famous address of Sherlock Holmes soon learned all about it from their new neighbor. 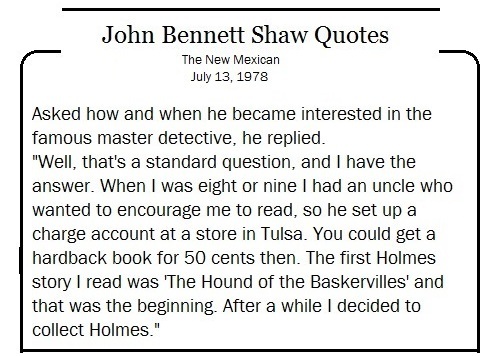 Very few residents of Santa Fe knew that John housed the most incredible collection of Sherlock Holmes books anywhere, but the word was out among the followers of Conan Doyle’s Super Sleuth. Before long, visitors began streaming in from all parts of the United States and beyond. It was easy to spot John Shaw’s car in New Mexico. Not only did Mr. Shaw have a sign outside his home advertising his connection to Sherlock Holmes, he purchased this license plate for his 1981 Ford, carrying the banner of Holmes everywhere he went. Limited to seven letters, John had to go with SHERLOK, but it made the point that Shaw and “Sherlok” were a team. Shaw kept dreaming up schemes to get his name “out there” where people needed to know more about Sherlock Holmes. In 1985 he hit upon the idea that a baseball style trading card would be the way to “get his foot in the door.” Shaw may have stretched the truth a bit, claiming his weight was 130 lbs. He may have weighed 130 in the eighth grade, but certainly not while he lived in Santa Fe. But, knowing John, he probably put that there to see if the person looking at the card had perception—did they see and observe. It was important to gauge how much work needed to be done with the Sherlockian newbie. He had handed out business cards all during his professional life; now was the time to be different and more casual—to make an impact. Artist Jeff Decker contributed this cartoon of Shaw as an infant to the Baker Street Journal dedicated to Shaw (December, 1990). And so it began, Shaw’s love affair with New Mexico and the shenanigans he devised around the name of this unsuspecting village of Moriarty. 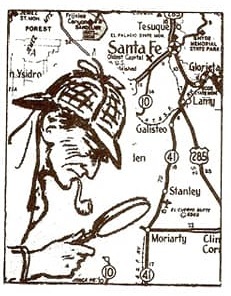 Sherlockian Sonia Fetherston (BSI - 2014), a frequent contributor to the Baker Street Journal, visited the village of Moriarty, NM, in 2016 to trace Shaw’s lasting influence. 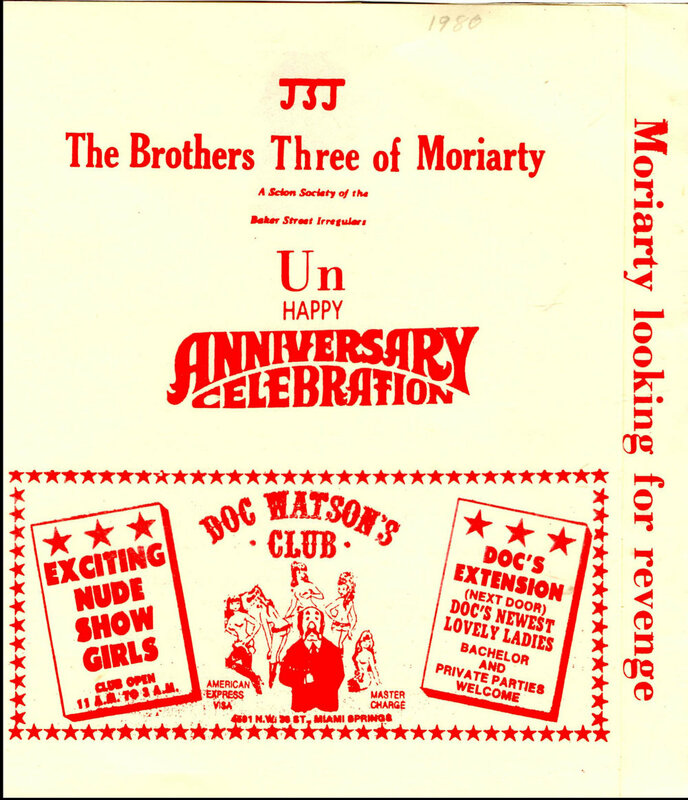 Once he got The Brothers Three going on an “irregular” basis, the UN-Happy Birthday celebrations for (and at) Moriarty followed close behind. The program below is from the 10th Annual UN-Happy Birthday gathering. Presentations were given, toasts were lifted (sometimes with explicit language), a quiz was conducted, songs were sung, and the finale was the “Recessional”: a processional to the Moriarty Memorial with the annual deposit. (More on that below). In a letter to Gael Stahl, Shaw had this to say about the 16th Moriarty Memorial Celebration (November, 1987). There are so very many friends to thank for their contributions to the Friends of John Bennett Shaw Facebook page, and subsequently to this website. Let me mention three (behind the scenes) encouragers without whose assistance this project never would have been possible. who gave me the spark I needed to attempt this dream. and made the outpouring of others possible. Steven Rothman, editor of the Baker Street Journal, who signed on early, was generous with resources, and stayed enthusiastically behind the project. was kind enough to edit all the text on this website. Any mistakes are mine, not his. Other important people are mentioned (and pictured) in the text of the website. My sincere thanks to each.